We have been experiencing seismic shifts in the consumer world brought on by a variety of trends happening simultaneously. This was brought into sharp relief by the massive write-down of assets by Kraft Heinz, the maker of (my old favorite) Kraft Macaroni & Cheese, amongst many brands with which we are all comfortably familiar. It seems these brands are contending with a shift in consumer preference (have you tried Gluten Free Mac & Cheese? ), but also upstart brands that are bypassing traditional distribution channels that big brands (like Kraft) tend to dominate. I have been writing about these brands for years, as they include Allbirds, Bombas, and Tens to name a few. These brands are creating value by imagining new products & categories, renting underutilized production capacity, and establishing direct relationships with their consumers to make a dime and to grow. I suspect this trend will continue, but also worry that the price to get noticed and acquire customers keeps going up. It will be interesting to see how social media giants (like Facebook or Instagram) and online retailers (like Amazon) will be able to continue to dominate. In this week's Loupe, we focus on a few health-conscious brands! I am amazed at what can be accomplished when people put their mind to it. It seems that a Swedish company took on the challenge of creating a nutritious and tasty liquid that didn't require a living cow to process it! They created Oatly, and the mission has naturally evolved to deliver a dairy substitute without taxing the planet’s resources in the process. That's a mission I, and all Millenials can get behind. Its impact is negligible; it is free of Gluten, dairy, 100% nut, peanut, dairy, egg, and soy free, non-GMO, and even Kosher! It's a superfood (super drink? ), my friends. Even the packaging is 100% recyclable. While this product is not new, they recently opened up their first US manufacturing (in New Jersey) to accommodate the explosive demand. While they are selling direct to consumer, they also must use the traditional distribution channels given the nature of the product and natural buying habits of the consumer. 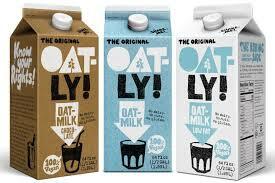 What I do know is that with a plant-based drink that tastes this good, and a brand that is this authentic, Oatly has found a winning formula. Hu Chocolate was founded based on a need. Founders Jessica Karp and Jordan Brown realized the importance of people getting back to eating, living, and thriving like humans should. Six simple life philosophies to get back to human emerged: unprocess (eat clean), move, sleep, laugh, play, and experiment. Through this analysis, they realized that they needed to create a chocolate bar that embraced their philosophy as there was nothing that met their demanding standards. There was a clear need for a Vegan chocolate bar free from dairy, GMOs, soy Soy Lecithin, Gluten, Refined Sugar, Cane Sugar, and Sugar Alcohols. Since inception, Hu Chocolate has been flying off the retail shelves. With numerous flavors, this fast-growing chocolate company is challenging traditional chocolate purveyors. Jessica is a trailblazer in the healthy food space with a successful restaurant and chocolate bars that stores can't seem to keep in stock. How did she get here and why ... watch my interview with Founder Jessica Karp and find out! Seismic shifts are happening at a breakneck pace ... embrace it, and consider Oatly, Hu Kitchen and it's Founder Jessica Karp Found!